What does weak ground mean? Weak ground occurs when the layers of earth are unstable and/or loose. Weak ground cannot adequately support the weight of structures or floors, so they subside and cause hazards. Uneven concrete floors, fractured floor tiles, and wall cracks, are all strong indicators of weak ground beneath the structure. Weak ground needs to be fixed as quickly as possible to prevent further damage. Jet grouting used to strengthen ground on a massive scale. There are a number of different things that can cause weak ground, both natural and man-made. For example, the ground may already be made up of loosely-packed materials such as soil or sand. Or human activities such as drilling and excavating can loosen previously-dense ground. How to fix weak ground? Mainmark specialises in soil stabilisation and ground compaction, foundation repairing, strengthening weak ground and making it suitable to support existing structures like buildings, bridges, and roads. Mainmark’s proprietary Teretek engineered resin solution assures sub-grade stability under existing on-ground structures including buildings, concrete floors, driveways, roads, paved airport runways, bridge approach slabs, bridge abutments, and more. Mainmark’s methods are fast, precise, neat and tidy, and don’t generally require you to vacate the building while work is being done. Mainmark’s ground-strengthening techniques create a strong foundation under on-ground structures of any size, from driveways to airport runways, and from residential homes to large office buildings. We have successfully strengthened and re-levelled the ground under thousands of homes around the world. As the weak ground under houses is strengthened, the house and its sunken floors and driveways are re-levelled; any internal and external wall cracks generally close up too. Most importantly, structural damage is resolved and, with a stable foundation, the future of the house is sound. 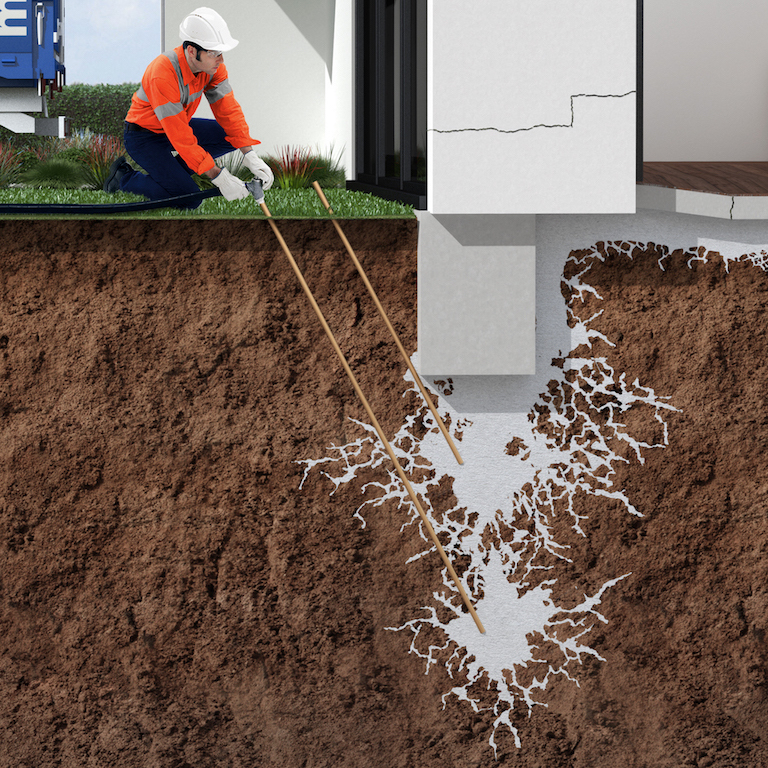 Our foundation repair solutions are the modern alternative to the traditional way of underpinning; it’s like keyhole surgery compared to concrete underpinning. Our proprietary solutions are cutting edge and use a series of small resin injection holes to underpin concrete slab floors. We can also raise and re-level ‘waffle-pod’ slabs, strip footings, and raft slabs, plus we can infill under paths and driveways. 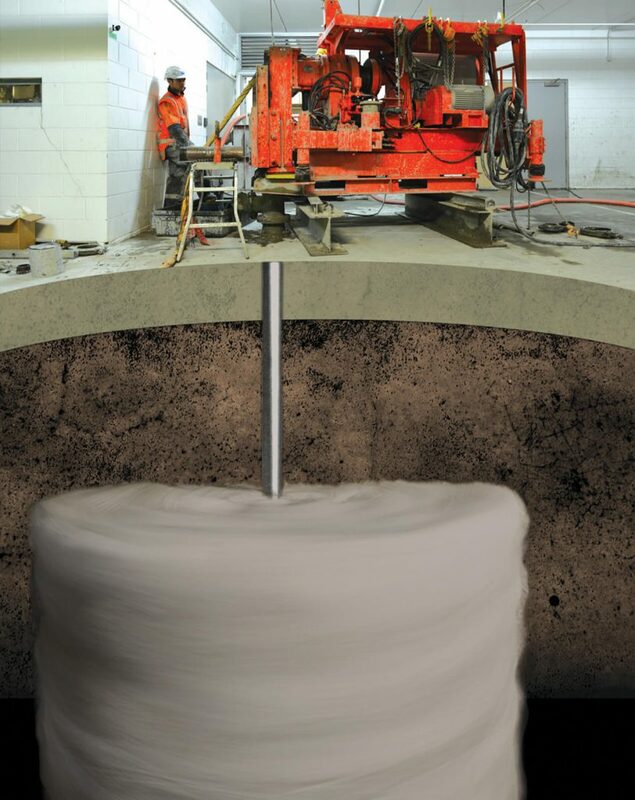 The method Mainmark most often uses involves injecting structural, expanding resins into the ground. This resin injection method is most effective where the sub-grade soils are cohesive. The resins and hardeners mix together in the ground, and expand to compact the adjacent soils and increase their load-bearing capacity.